Many industry insiders believed that they had heard the death knell for the M1 when Lamborghini was dropped as BMW’s partner in the project. After lengthy delays a very cumbersome method was found to start the production of (at least) the 400 cars that were necessary to obtain F.I.A. homologation. 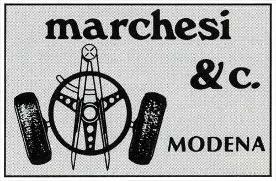 The frame of the M1 was build by Marchesi & C. This company was founded on Januari 1st, 1965 by Umberto Marchesi, Silvano Cantelli and Mauro Bonora. The goal was to build car frames. At the end of the seventies they employed about 35 people. 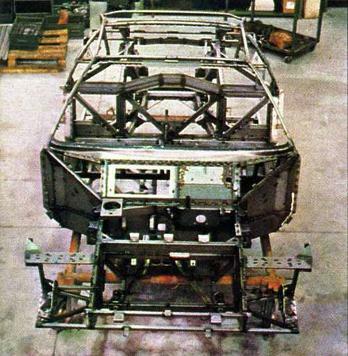 Before building the skeleton for the M1, Marchesi had build frames for Ferrari, Lancia (the Stratos), Lamborghini and DeTomaso. Other projects that saw the light of day in the 37000 sq ft production facility were the frames for D’Allara and AMS racecars and the vehicles for towing and firefighting at airports. The M1 backbone is made from steel tubes and is reinforced with sheet metal. Each frame takes 150 man-hours to complete and weighs 194 kg (about 430 lbs) when it leaves the Marchesi factory (without paint). The frame passed the strict regulations necessary to obtain the ABE (Algemeine Betriebs-Erlaubnis). This translates into “general operating permit” and it basically means that the German government deemed the M1 roadworthy. BMW killed two birds with one stone by getting this permit for the frame. Firstly, the higher costs of doing crash tests with finished cars were avoided. Secondly, the possibility of future facelifts for the M1 was left open; BMW could choose to change the fiberglass bodywork without having to reapply for the ABE. The atmosphere at Marchesi could be described as ‘laidback’ and ‘devoid of red-tape’. Marchesi himself made the tools that were necessary for the production of the M1 backbone after a casual, visual inspection of the five Lamborghini made prototype frames. To him, building car frames was more art than science.